++++New Condition!! Faster Estimated Delivery. No Sales Tax & Free Shipping with Tracking No.! Thank you! Have a Great Day! ❀ Mains powered only. Cannot be used with batteries. This item will be sent through Expedited Delivery (International Shipping) With Tracked. Delivery times about 7-10 business days vary depending on location and customs. Spread some festive cheer with this musical LED Christmas fountain by Christow. 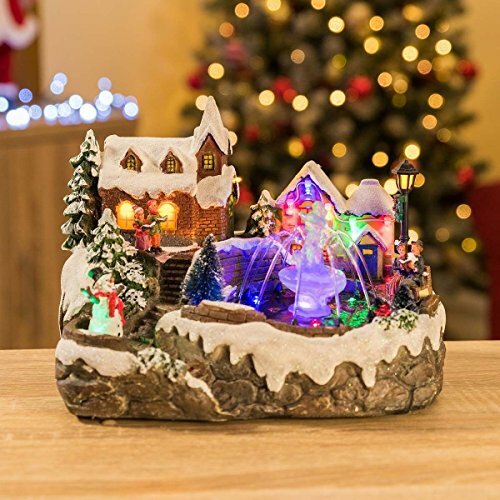 This Christmas ornament feature a lovely tranquil village scene with a snowman standing on some steps, two carol singers outside a church and a couple sitting beside a fountain which is illuminated by colour-changing LEDs. When switched on, water shoots out of jets that surround the fountain to create an eye-catching water feature. Plays 8 classic Christmas songs As well as filling your home with the sights of Christmas, the fountain fills your home with the sounds of Christmas. The ornamental scene plays eight jingles, including 'We Wish You A Merry Christmas', 'Dashing Through The Snow' and the timeless classic, 'Oh Christmas Tree'. You can turn the fountain and lights on with or without music using a switch on the base. Hand-painted polyresin construction The scene is made from durable polyresin with a beautiful hand-painted finish. From the rustic brickwork on the buildings to the glittery snow-capped roofs - no stone has been left unturned when it comes to detail. As the LEDs that surround the fountain change colour, the water glistens and sparkles to stunning effect. It's a joy to behold for youngsters and adults alike. Powered by UK BS 3-Pin Plug The festive fountain is powered by a UK 3-pin plug. If it was battery-powered, the water jets would be far less powerful and it would be far less impressive to look at. Providing a nearby plug socket is present, you can place the Christmas village scene on any flat surface such as a table, windowsill or mantelpiece. Rubber feet help to protect the surface from marks and scratches. Mains powered only. Cannot be used with batteries. If you have any questions about this product by Christow Decorations, contact us by completing and submitting the form below. If you are looking for a specif part number, please include it with your message.